After comedian Jerry Seinfeld retired from his popular sitcom in 1998, he looked for new worlds to conquer. 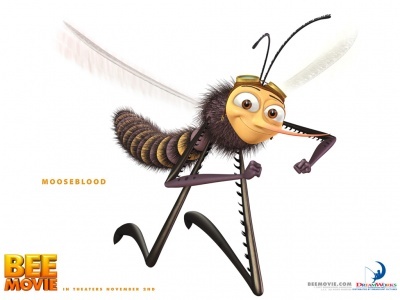 He co-wrote a script about bees with Spike Feresten, Barry Marder, and Andy Robin and told DreamWorks Animation that he would be willing to star in it. The result was "Bee Movie" (2007), directed by Simon J. Smith and Steve Hickner. 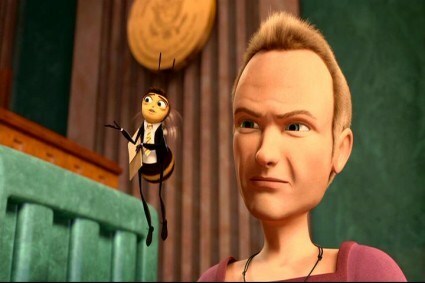 "Bee Movie" is a computer animated feature film that also starred Renee Zellwegger and several of Jerry's old buddies from the sitcom. While the film did only average business for a computer animated film, it is an enjoyable treat that should delight youngsters of all ages. 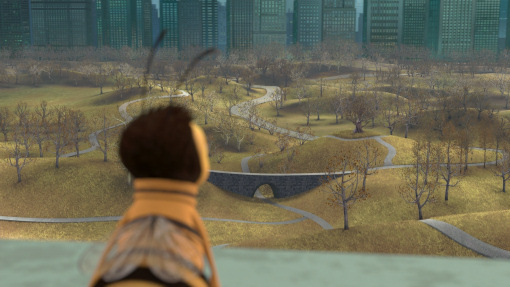 Seinfeld stars as Barry B. Benson, a worker bee in a hive in Sheep Meadow, Central Park in New York City. 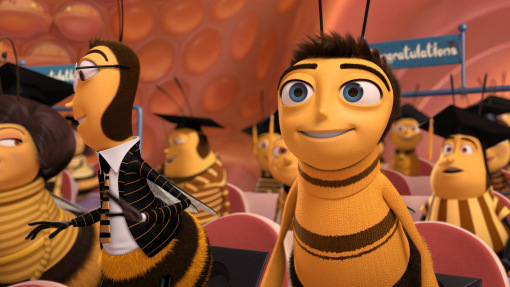 A recent college graduate, Barry's best friend is Adam Flayman (Matthew Broderick), and they are about to join the bee work force. Barry, however, is depressed about the idea of working for the rest of his life, so against the advice of Adam he leaves the hive to see the world. He has various adventures, but things start to get dangerous after he runs into some humans and he decides to return home. Flying home, it begins to rain, and Barry flies into a window, landing on the windowsill. Trapped inside the house, he narrowly escapes death before being rescued by florist Vanessa Bloome (Zellwegger). After thinking about it, Barry goes back to thank Bloome, and the two become fast friends. His bee friends and family, and her human friends, though, think this relationship is scandalous. Learning more about humans from Bloome, Barry finds that they eat bees' honey. Intrigued, he hitches a ride on a truck to the place that produces the honey, Honey Farms, and on the way meets mosquito Mooseblood ( Chris Rock). After Mooseblood leaves to get some blood for food, Barry continues on to the farm and witnesses the process of producing honey. Irked by the idea that humans are stealing bee honey for their own purposes, Barry decides to sue humans to get an injunction against them and make them stop. Barry becomes famous, appearing on the top-rated human news shows. At trial, defense lawyer Layton Montgomery (John Goodman) accuses Barry of various things that send Barry into a rage. He stings Montgomery, which damages his case, but then rectifies matters by producing the smoke machine with which Honey Farms pacifies bees and makes them produce honey on command. Winning the case, Barry secures the return of all honey in the world to the bees. This, however, doesn't turn out very well, as it puts hordes of bees out of jobs. Without bees pollinating flowers, plants begin to die, and the food chain is disrupted. Desperate to set things right and restore nature's balance, Barry and Vanessa go to the Tournament of Roses Parade in California to find pollen-filled flowers. Along the way, their flight from California to New York is diverted due to storms. Since time is of the essence, Barry tries to force the pilots to fly through the storm anyway, but he only succeeds in knocking them unconscious. The nation of bees, however, flies up to the plane and helps it to land safely. Having saved the world's flowers by retrieving the pollen from California, Barry is pleased to see that honey production has resumed. Humans and bees now understand each other better, and bees become a willing part of the process of producing honey for humans. Barry and Adam get jobs, with Adam and Mooseblood working with Bloome as lawyers. Barry, though, can't help himself from trying to make the world a better place, and is last seen talking with a cow about how humans use her milk. 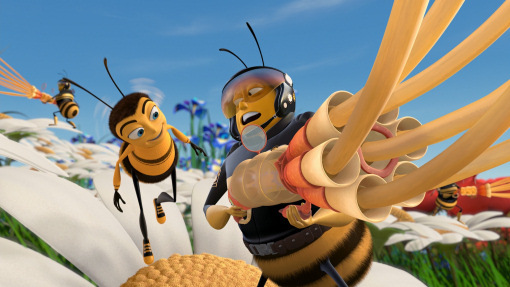 "Bee Movie" has quite a high-concept plot that may be difficult for some children to follow. 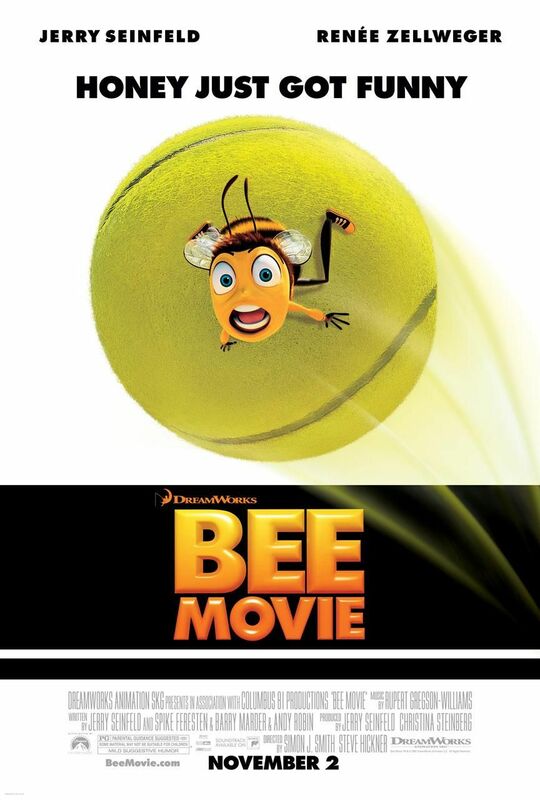 It does have a level of wit that is often missing from animated films, with the sure Seinfeld touch evident throughout, from the New York City locale to the puns and witticisms (the title itself, "Bee Movie," is a pun on "B Movie," the old industry term for second-rate films). Funny and relaxed, "Bee Movie" will entertain just about everyone if they have an open mind about the world and can accept the premise of bees who resent people eating their honey. The animation is good, but not exceptional. Animation was in a period of rapid advancement, and "Bee Movie" unfortunately does not fully take advantage of all those improvements (why isn't this in 3D?). The real draw is the cast, with Michael Richards, Patrick Warburton, and Larry Miller from "Seinfeld" giving the film a warm, comfortable feeling. Everybody is safe and non-threatening, from the genial Broderick to the dramatic Megan Mullally. "Bee Movie" is more cerebral than most animated films, relying on thoughts and relationships to entertain rather than slapstick humor and lots of action. As such, it is reminiscent of "Seinfeld," and has that off-handed charm that infused that television series. The big animated film of 2007 was "Ratatouille," and while "Bee Movie" is fun, it is no "Ratatouille." The box office worldwide was $287 million, a disappointing total. Part of the problem with the audience's reception of "Bee Movie" may have been the somewhat eccentric plot. Jerry Seinfeld made his name with observational humor and wry observations on the human condition which plays well in stand-up and over the course of a television series - you'll have to decide if that translates well to a movie about bees. Another problem is the sheer weirdness of implying some kind of romantic relationship between a bee and a human being. It is simply difficult to get too worked up about whether bees are upset about how people use their honey. Also, there are inconsistencies, with Barry being a tiny insect at times, but then, as in the picture above, suddenly human-sized. Yes, nit-picks, but details like these are important to audiences. That "Bee Movie" did as well as it did is probably as much due to the film's spritely charm and friendly cast as with anything else. The soundtrack is one of the film's highlights, with Sheryl Crow providing an energetic version of The Beatles' "Here Comes the Sun" and the film's use of The Archies' old tune "Sugar Sugar." Rupert Gregson-Williams provided the rest of the fine score. 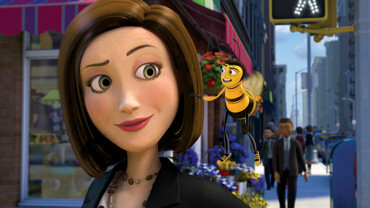 "Bee Movie" is quite fun, and is particularly great entertainment for children. Adults may get a bit tired with the sometimes too-cute cleverness (something Seinfeld is famous for, either you like that sort of thing or you don't), but every parent should be delighted to see their children joyfully watching the colorful bees fly around saying funny things. As is always the case, these kinds of animated films that are filmed from a non-human perspective provide a different take on the world that is impossible to duplicate in live-action films. "Bee Movie" is a good choice for a day off from school or a rainy day when everybody, including bees, have to find some way to entertain themselves. 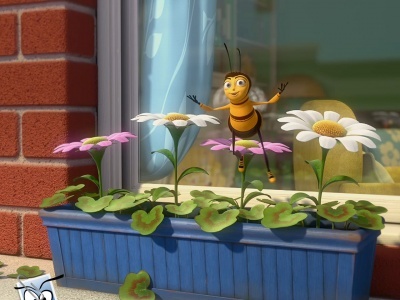 Below are two videos: the first is a trailer from "Bee Movie," and the second is an alternative ending to the song "Here Comes the Sun" as sung by Sheryl Crow. There have been rumors of a sequel, but nothing definitive. Get Ready for More Fun with the Minions in "Despicable Me 2"
Despicable Me (2010), an animated feature film starring the amiable Steve Carell, was a solid if not spectacular hit from the French division of Illumination Entertainment and distributed by Universal. A colorful fantasy, it became somewhat of a cult favorite with its hordes of "minions" and a high-concept storyline. Carell played Felonious Gru, a scheming villain turned by unexpected circumstances into the over-protective father of several girls. One thing missing in that film, though, was an audience-friendly romance. "Despicable Me 2" (2013), directed by Pierre Coffin and Chris Renaud and written by Cinco Paul and Ken Daurio, rectifies that omission while continuing the zany confrontations between Gru and his enemies du jour. 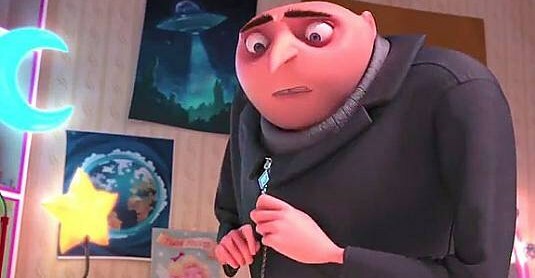 Gru has a reflective moment in "Despicable Me 2"
The Anti-Villain League (AVL) learns that a secret lab at the Arctic Circle has been stolen by a vehicle using a strong magnet. The lab was developing a formula PX-41 to transform people into invulnerable killers. Searching for answers, the AVL decides to use Gru to investigate and recover the missing PX-41, but, unsure whether he will agree, send agent Lucy Wilde (Kristen Wiig) to abduct him. She stuns Gru and takes him to AVL's underwater headquarters, where AVL director Silas Ramsbottom (Steven Coogan) asks Gru to find the PX-41. He declines due to his other projects and duties as a father, but Lucy gives him her card in case he changes his mind. When he returns to his lab, Gru finds that his own project, producing bottled jellies, isn't working out and loses his project scientist, Dr. Nefario (Russell Brand). 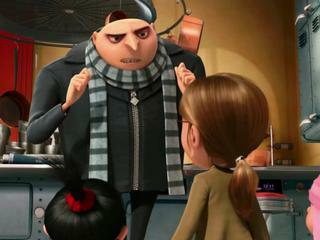 Gru then changes his mind and contacts Lucy to take on the assignment. Evidence suggests that the PX-41 has been taken to the Paradise Shopping Mall. Gru and Lucy go undercover in a cupcake shop there and focus on the owner of a mall restaurant, Eduardo Perez (Benjamin Bratt). 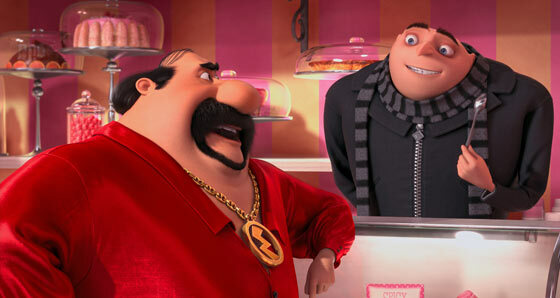 Gru thinks Eduardo is actually "El Macho," a super-villain previously thought to be dead. Gru and Lucy break into the restaurant at night to investigate, but narrowly escape detection after being spotted by Eduardo's pet chicken. Nothing in Eduardo's restaurant links him to the PX-41, but they do find a jar of secret-recipe salsa in Eduardo's safe. Next, they investigate wig merchant Floyd Eagle-san (Ken Jeong). 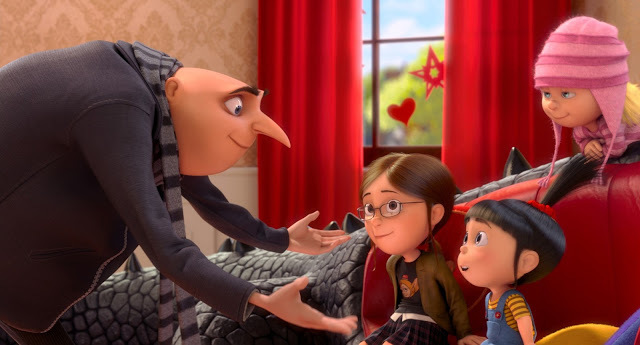 Meanwhile, Gru's eldest daughter Margo (Miranda Cosgrove) develops a crush on Eduardo's son, Antonio (Moisés Arias), which clouds Gru's judgment and causes him to make baseless accusations against Eduardo and Antonio. Gru's friends want to find him a new wife, so neighbor Jillian (Nasim Pedrad) sets him up with her friend Shannon (Kristen Schaal). The date is a disaster, and Lucy rescues Gru by tranquilizing Shannon, causing Gru to realize that Lucy is his true love. The investigation continues, and the AVL arrests Floyd Eagle-san due to an empty PX-41 jar found in his wig shop. Considering the case closed, the AVL reassigns Lucy to Australia, and Gru becomes upset that he won't see her anymore. Before she leaves, though, Gru goes to a party at Eduardo's and learns that Eduardo in fact is El Macho and that Dr. Nefario has changed sides to work for El Macho. El Macho asks Gru to join him in conquering the world, but Gru refuses. After Antonio dumps Margo, Gru freezes him with his death ray. Lucy flies off to Australia, but on the plane she realizes that she would rather be with Gru and jumps out of the plane to hang-glide back to Eduardo's party. 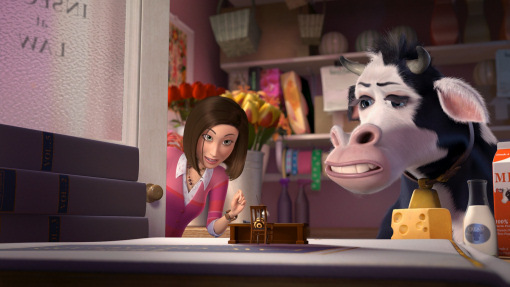 Eduardo's chicken uncovers her identity as an AVL agent and captures her, but Dr. Nefario calls Gru to tell him. Gru disguises two of his minions and has them take him into El Macho's fortress as their supposed prisoner. El Macho has been converting Gru's minions into his own lackeys using the PX-41, but Gru changes them back using an antidote prepared by Dr. Nefario. Gru has a showdown with El Macho, which Gru wins using Lucy's special lipstick taser. Lucy is tied to a shark rocket, and while he tries to release her, El Macho's chicken triggers the rocket, sending them toward an active volcano. During the rocket ride, Lucy agrees to Gru's request for a date, and they narrowly escape death on the rocket. Many dates later, the two are married. 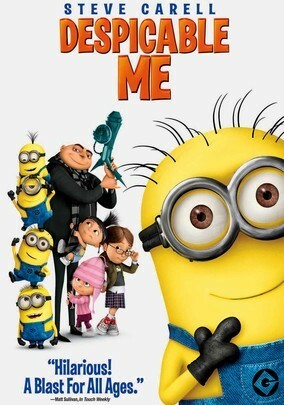 "Despicable Me 2" is a fun 3D computer-animated family spy comedy that serves as mindless entertainment. Kids especially will enjoy the fart jokes and zany characters, while adults will focus more on the tentative romance between the competent Lucy and the unpredictable Gru. It is a nice sequel in the sense that it is not simply a re-worked retread of the original, as is so often the case, but a welcome extension of the story. There are a lot of laughs, as you would expect in a Steve Carell comedy, and the visuals are inspired. The secret attraction, of course, is the horde of minions that follow Gru but can go off on their own tangents. In that sense, it is a lot like the "Ice Age" films which developed the throw-away character of Scrat into one of the most beloved animated characters of all time. Is this a film for everyone? Pretty much, as long as you aren't looking for anything deep and meaningful. No, it isn't as groundbreaking and fresh and inventive as the original, but that's a very steep task facing any sequel. There's something to be said for the comfortable old chair with which you are familiar. The minions are so popular that they are getting their own spinoff entitled, appropriately, "Minions." It is scheduled to come out on December 19, 2014. The success of the "Despicable Me" franchise is shown by the fact that the spinoff will star Sandra Bullock, who hasn't done animated films before. "Minions" will be a sort of prequel to "Despicable Me," and is sure to be another crowd-pleaser. "Despicable Me" is the brainchild of one-time Disney animator Sergio Pablo. The El Macho character is a direct homage to the series' roots. 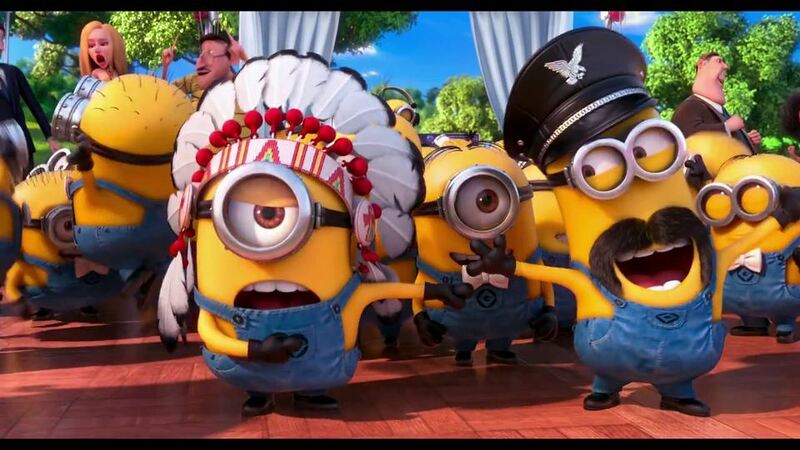 You can't argue with success, and "Despicable Me 2" is turning into as big a hit as the original. It opened at number one at the box office and was one of the big summer hits of 2013. Among its other accomplishments, it had the highest five-day start ever for an animated feature, which means you'll be seeing more of Gru down the line. About the worst that you can say about "Despicable Me 2" is that it is a kid's movie and predicable, but most people will enjoy the minions and the romance and not worry too much about plot quibbles. This goes into the "it is what it is" file, and only you know if you would enjoy an innocuous animated film with no pretensions, a simple story that contains no big moral lessons, and a lot of little crowd-pleasing touches.